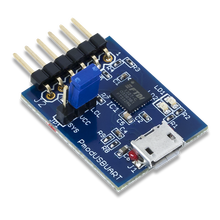 Pmod USBUART provides a USB to UART cross-conversion through the FTDI FT232R. Users may send data in either direction on the Pmod and receive the converted data in the appropriate format. Related links to "Pmod USBUART"